Not all bonds must be renewed by December 31st, but it is imperative that those principals who need to meet that deadline do so on time. This guide aims to answer the four most common questions principals have when renewing surety bonds. Can I renew before my bond term expires? Of course! We highly recommend renewing all surety bonds before the current term ends. In that way, early renewal all but eliminates the chance of any complications that could arise due to a lapse in coverage. By waiting until the last minute, it’s possible the obligee may not process the renewal immediately. This is especially true when local and state offices may have limited holiday hours at the end of the year. In order to avoid such issues, Brunswick Companies will begin contacting you at least 60 days out from your renewal date. What is the typical cost for surety bond renewals? Risk: Underwriters will weigh the likelihood of a claim against the bond by reviewing the frequency of claims for that bond type in the past. Multiple years in the industry and few claims may help you secure a lower rate on your surety bond renewals. Bond Amount: The bond amount goes hand-in-hand with risk. As the bond amount goes up, the surety company may become more wary of the principal’s ability to repay the cost of a claim against the bond. Giving your surety provider access to your financial statements will help them in understanding your financial stability when requesting higher bond amounts. Credit Score: Before issuing a bond, many require underwriters to review your credit. As far as the premium is concerned, this can be helpful or harmful depending on your credit score. However, if your credit has significantly improved, you may find yourself paying a lower premium for surety bond renewals. Generally, it’s impossible to know exactly what surety bond renewals will cost without speaking to a surety professional. If, however, nothing has drastically changed over the course of the previous bond term, you can safely assume the renewal premium will be similar to the current term. What documentation will I receive after renewing my bond? Depending on the type of bond being renewed and who requires it, the documentation may vary. Some bonds require a continuation certificate, while others don’t require any new or additional documentation. In the case of a bond with a fixed-term end date, the obligee requires an entirely new bond. Brunswick Companies will provide all necessary paperwork to you at the time of renewal. What if I choose not to renew my bond? Be aware of the repercussions! In the case of license and permit bonds, failing to renew will inactivate the license and/or permit. If you decide to reactivate the bond after its canceled or terminated by the obligee, you may have to begin the application process all over again. When it comes to contract and court bonds, they cannot be terminated by failing to renew. In order to cancel these bonds, you must first provide the surety company with a letter from the obligee that releases you from further liability. Failure to pay the premium or send such a letter could result in legal actions to collect the payment. 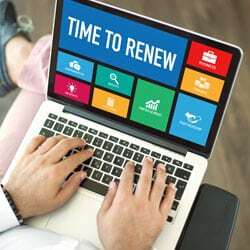 Now that you understand the renewal process, it should be clear that it is easier than the initial application process was. You should rest assured that Brunswick Companies has already been working on your renewal well before its due date. In fact, by the time we contact you for the renewal, we already have the quote prepared and ready for payment.